So Gus graciously sent a load of swords out to us East coasters here in VA, some really really nice ones, and Don Rice graciously hosted us out in his gigantic and beautiful farm. We were on top of this giant hill that could really be considered a small mountain, with a gorgeous view, and we were armed to the teeth. What a perfect seeming day. And as soon as we unload the 30+ swords, 11 of which Gus had sent us, the rest were personal pieces by both Gus and from various makers from Albion to A&A... then the rain came down. All day. But despite that, we got to come out of the gazebo in the short spurts where the rain calmed down, and we got to some dry handling and a little bit of cutting done. I know others will chime in with their thoughts, but here are some of the highlights that Gus sent us. Now THIS is a sword. I fell in love with this baby. It's HUGE, but handles like it weighs nothing. Lighting fast, and if you needed to choke up on the ricasso, it is still incredibly manueverable. It's a real "reach out and touch someone" sword. Sliced through pool noodles with surprising ease, and worked beautifully for the Liechtenauer tradition of longsword. This may possibly be one of my favorite ATrims that I've handled to date, though it's so hard to pick only one. I specifically asked Gus to send this one, because I was really curious about it. This is a fun little guy. Going through Marrozzo's guardias and cuts, it felt very natural in the hand. It's light enough to do work well for civilian defense, but more than stout enough for use as a military sidearm. Here's one that I'm sure many were very interested in. The DN1532 is a very lightweight hand and a halfer, though in my hands it felt more like a single hander with a long enough grip for the second hand if needed. While it's not exactly my personal tastes, it's a very nice sword that was well liked, and I know there will be many others who will love it. Now this is one bad mamba jamba! While I lean towards swords that require a little more finesse, there's a definate primal feeling of, "I need something to smash," when you pick this puppy up. A big, broad blade, this is not something you want to get in the way of. A tad slow on the recovery, but not so much as to negate it's effectiveness. This one's a SERIOUS chopper. I could be wrong on which AT-number I'm attributing to this one (Gus? ), but this single hander was a well liked piece by everyone. We'd had a number of shields present, including many Don had made, and this piece felt right at home in that setting. A fast cutter, quick on the recovery, but still packing quite a punch on the strike. I'm sure others will chime in with their thoughts of these babies. It sounds like you had a good time Bill, in spite of the rain. 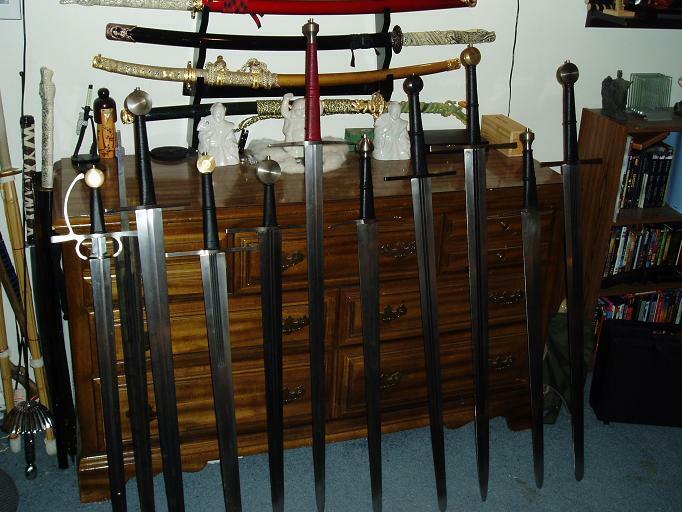 It also seems that Gus sent along some very interesting swords. The Danish two-hander is indeed a nice looking piece. I like the multi-fullered H&H as well, particularly with the blackened furniture. What other swords were present, and any feedback on those? I just started two weeks of vacation and I need to paint my house. I *really* wish it would stop raining. Because of the rain, I didn't get pics... but they were sent to David Stokes for another cutting party... maybe he'll have pics. Aha, David posted this pic on SFI, so I'm stealing his pic because he hasn't posted himself yet. Anybody wanta count the wallhangers in teh background? It looks as if you have quite a bucket 'o' swords there David! Sounds like the party will be a blast. Is that one of those older MRL epee bladed rapiers in the left corner, David? 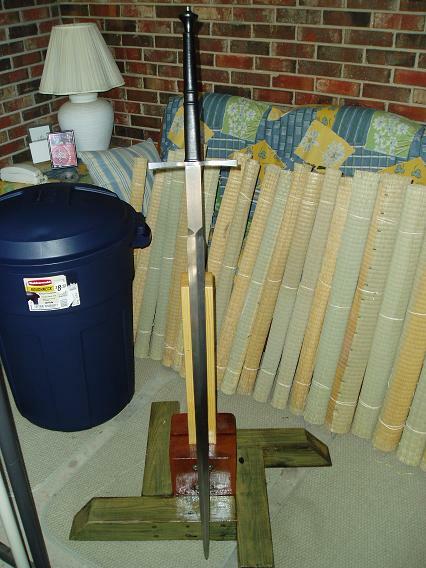 its a french made doublewide Epee blade mounted on a older MRL hiltsetup. Eddie Floyd did the blade mount for me. it was my old fight sword back when I took lessons from him. Mr Stokes, the John McEnroe in the sport of fencing. A nice group of sword there. Sorry, I dont follow Tennis........ could you bring up to speed on this comment? Johnny Mac was a very talented, belligerent, hot tempered, and *very* vocal tennis player. One of his matches was always great fun to watch. Mr. P. Kelly said it for me. Just me trying to be funny with the tennis racket wrap. He was a wery outspoken person, but a great caracter. the "bad boy" of tennis in his time. But he seems like o good bloke actually. I saw him at Jay Leno a little while ago. That's a fast looking sword David. Glad it got to you okay, David. Isn't that a fantastic feeling sword? Especially for such a huge thing. Maybe it's a subconscious case of narcissism that I relate to things that are tall and skinny. And yes, the 1591 "worked" . I tried gripping with the riccasso for a few thrusts, nice stuff, there, though griping at the riccasso for a pretty good powered cut is a bad idea due to it being in front of the main node...... lol..... about a split second after that cut falls you realize the importance of gloves. As for the other babies, they all did extremely well! Sounds like you guys had a great time! Did you try cutting against anything heavier than pool noodles? What were the results if so? Hi Shane, Im assuming the question was directed at me. We didnt cut pool noodles at all, i feel pool noodles have the resistence of air, and really dont show anything about the sword. As long as you can ge the sword up to speed which is not a bit feat. I have seen ppl cut pool noodles with taiwanese wallhangers and the cutter have terrible blade alignment and still made it through. I have cut them before, but besides wasting good pool floats, its sorta a pointless actiity. We cut water filled bottles and I had about 30 tatami mats their as well. The tatami is what we really focused on.